"Can You Make It !!??" Teleport into a giant arcade machine for a truly interactive gaming experience where audience members are selected to become heroes in a voice-activated side-ways scrolling arcade-adventure! By receiving vocalised commands from the crowd, the hero is guided through challenging levels with engaging narratives, entertaining puzzles, puppeteers, props, power-ups, end of level boss battles and all the zany 8-bit sound fx from the old arcades! Our dedication to combining audience participation and retro gaming make for an unforgettable experience. 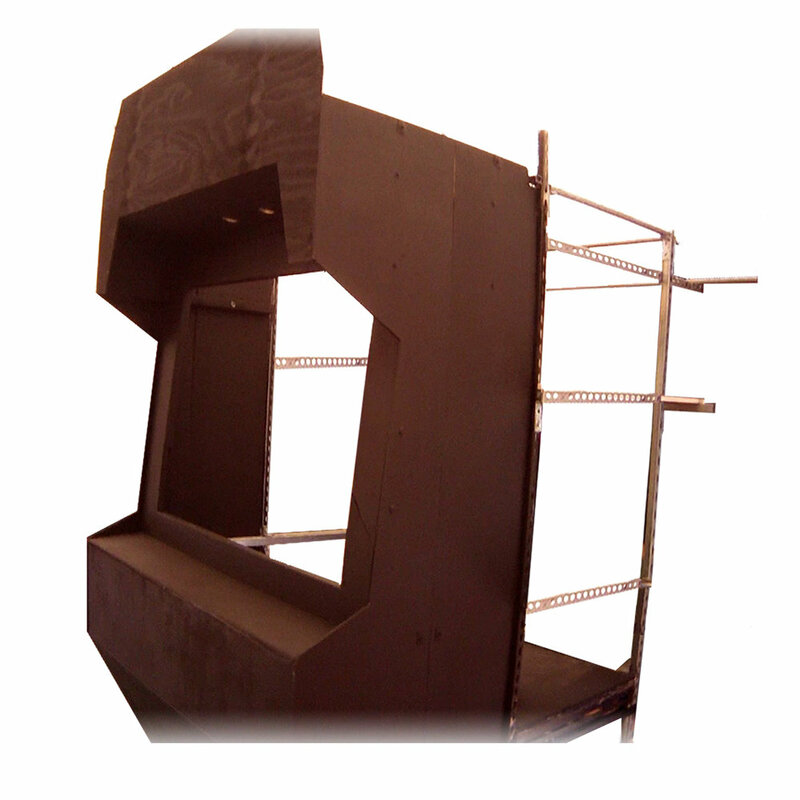 A unistrut and wood panel stage equipped with active speakers and interior lighting. Backstage space for prop management and a hidden station built for the narrator to control game sounds and voice. Required footprint is approx 2 metre wide at the front and 4.5 metre wide backstage. Entire depth is about 4 metres and it stands about 3 metres tall. 1 full day required for setup. The Human Arcade Zone is a delightfully interactive sideshow, mini stage or DJ Booth. Perfectly suited to gaming conventions + promotions as well as retro or sci-fi themed events + parties! Contact us to discover how we can work together to make an exciting and engaging spectacle for your audience. As an audience participatory installation, the Arcade Zone is uniquely captivating but it is our attention to detail and character that really makes this special. The game and narrative are fully customisable to support your vision or promotion, which means your ideas and/or products can be developed into props, prizes, puzzles or even made into end of level bosses! "The Arcade Zone team were simply awesome, an absolute pleasure to work with."